Understanding the behavior of dense hydrogen remains a major challenge in both condensed matter physics and energy science, and high-pressure experiments and theoretical calculations have uncovered a number of novel phenomena in this fundamental system. Theoretical work by CDAC Research Scientist Ivan Naumov and CDAC Director Russell J. Hemley reveals new behavior, indicating that dense hydrogen could be a topological insulator and semimetal leading to possible surface superconductivity. In his well-known 1968 paper [Phys. Rev. Lett. 21, 1748 (1968)], Ashcroft predicted that hydrogen and hydrogen-dominated materials should be good candidates for high temperature superconductivity with a Tc at about room temperature or even higher. These materials, especially hydrogen, have relatively high phonon frequencies and, according to the McMillan formula, should exhibit high Tc. But in order to be superconducting, hydrogen should be at least metallic, which is theoretically possible at very high pressures. The new work from Naumov and Hemley shows that dense hydrogen can behave as a topological insulator, meaning that it can have metallic surface states even when the bulk material remains insulating. The results are important for the interpretation of existing experimental data on hydrogen conductivity and suggest that dense hydrogen is capable of exhibiting an unusual form of surface conductivity. It is well known that 2D or quasi-2D systems can be potentially good superconductors. Examples include the cuprates in which superconductivity is confined to planar CuO2 layers. Highly oriented pyrolytic graphite provides another example, in which superconductivity is localized at the 2D interfaces. 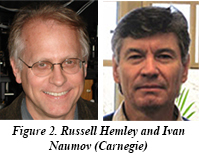 From the results of the present work, the existence of such “surface superconductivity” is predicted to exist in compressed hydrogen [I. Naumov and R. J. Hemley, Phys. Rev. Lett. 117, 206403 (2016)].